For sheet music songbooks, click here. This is not a book but a special edition magazine that was available in late 2017, in grocery stores and bookstores. While the subtitle claims it is the "untold" story of Billy Joel, it actually does not contain any new information that cannot be found in previous biographies. Still, it is a reasonably well-done overview of Billy's life and career containing information that most casual fans would not be aware of from mainstream media. The 96-page magazine consists primarily of large photos rather than text. Most of the photos are also nothing new, the same photos that are typically used on many websites. But again, overall, it is a good-looking and well-organized overview. This book by music professor Joshua S. Duchan (Wayne State University) does an excellent job of exploring various themes found in Billy's music through an examination of specific songs and events in Billy's life. Different chapters are devoted to major themes such as relationships, politics, and geography, places & spaces. From Amazon.com: "Despite his tremendous success, Billy Joel’s gifts as a composer and commentator on American life are long overdue for a thorough investigation. In Billy Joel: America’s Piano Man, music historian Joshua S. Duchan looks at the career and music of this remarkable singer-songwriter, exploring the unique ways Joel channels and transforms the cultural life of a changing America over four decades into bestselling song after song and album after album. Original interviews with Billy Joel blend with Duchan’s engaging analysis to provide readers of all backgrounds and ages a new look at these unforgettable songs. Music lovers and historians of both the academic and armchair variety will find this exploration of Joel’s work a rewarding adventure into America’s social, cultural, political, economic, and—above all—musical history." See Amazon.com description below. There is only one user review of this book on Amazon.com which is not favorable. From Amazon.com: "​Over the course of his career, Billy Joel has released a series of remarkable albums that together chart his journey as an artist from relative obscurity to international success. In Experiencing Billy Joel, musician and writer Thomas MacFarlane explores that musical journey, from Joel’s apprenticeship in the Long Island music scene to his experiences in both New York and Los Angeles writing and recording his own unique brand of piano rock and pop. After achieving a certain degree of musical success in the late 1960s, Joel embarked on a career as a singer-songwriter in the early 1970s. Although his initial albums demonstrated a precocious mastery that helped establish him in the field, his full potential as a recording artist blossomed on The Stranger (1977), created under the guidance of legendary producer Phil Ramone. Subsequent releases explored a variety of musical styles and helped solidify Joel’s reputation as one of the most important pop composers of his era. Experiencing Billy Joel explores each of Joel’s albums, laying out their appeal to musicians and non-musicians alike while also exploring the various production styles that have characterized Joel’s development in the studio. Along the way, MacFarlane reveals how Billy Joel’s recorded works as a whole serve as the foundation for a complex and enduring musical legacy." This is the definitive biography of Billy Joel, and well overdue. After "The Book of Joel: A Memoir" was cancelled (see bel0w), author Fred Schruers found another publisher. See this article. His new biography, simply titled "Billy Joel," was published in October 2014. It is the first authorized biography of Billy Joel and a good read. According to Amazon. com: "In Billy Joel, acclaimed music journalist Fred Schruers draws upon more than one hundred hours of exclusive interviews with Joel to present an unprecedented look at the life, career, and legacy of the pint-sized kid from Long Island who became a rock icon. Exhibiting unparalleled intimate knowledge, Schruers chronicles Joel’s rise to the top of the charts, from his working-class origins in Levittown and early days spent in boxing rings and sweaty clubs to his monumental success in the seventies and eighties . . . "
See this web interview with Fred Schruers about the book. The paperback edition of the book came out in November 2015, just in time for Christmas. It was right on time. Publication of this book was cancelled. It was originally planned to come out June 14, 2011. Amazon.com description: "This soul-searching chronicle offers fans an unprecedented glimpse into the heart and soul of one of the world’s best entertainers . . . here the beloved songwriter offers a serious and reflective memoir of his life from early hard times to top-of-the-world successes, including the ups and downs of romance (and his marriage to Christie Brinkley), insights about fatherhood, and reflections on both the joys and the burdens of superstardom. . . . "
This book sounds very good, but there are no Amazon reviews. The imprint Praeger has published a series a these books that include a biography, song lyrics, and commentary, for several other artists including Tom Waits, Carole King, Sting, Bob Marley, Ice Cube, Paul Simon, and others. The KISS version has not come out yet. From Amazon.com: "The Words and Music of Billy Joel examines this influential musician's songs in detail, exploring the meaning of the lyrics and placing Joel's artistry in a regional and cultural context. Covering work that ranges from Joel's recordings with the Lost Souls to his classical compositions, the book focuses on the dozen studio albums of popular music released between 1971 and 1993. A bibliographic essay is included, as are both a discography and a filmography. There is also a special focus on the interpretation of Joel's songs by other recording artists." This book was originally released in 2005, and an updated version was released in April 2011. The new version is shown to the left, the earlier version is below it. That's right, they use the older photo for the newer version. This is a reasonably good biography of Billy Joel by music writer Hank Bordowitz. Much of the information in the book is largely derived from other written sources (with the notable exception of Bruce Getile) but it is still a well-organized and written summary of Billy's life and music. It reads well and quickly, and is relatively well-balanced, neither overly praising Billy nor condemning him. I like this book better than the Mark Bego biography (below) though both are pretty much comparable in terms of factual information. Neither, however, have any direct interviews with Billy Joel like the Fred Schruers book that came out in 2014 and is the definitive biography on Joel. 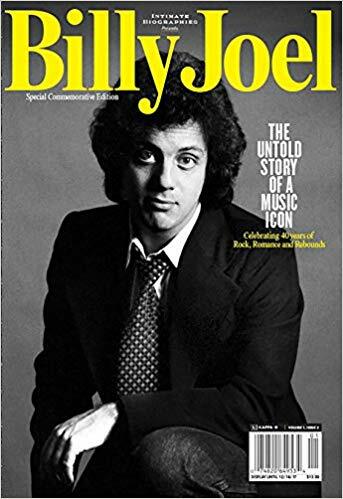 This is a decent biography about Billy Joel albeit there are no direct interviews with Billy, and several long passages where former band members vent about Billy with no description of Billy's side of the story. Bego has churned out biographies of many musicians, but this one suffers from not interviewing Billy Joel himself. Again, Bego does interview former Billy Joel bandmates and sheds light on the breakup of the band after 1987. I have mixed feelings about this book. On the one hand, it has some interesting tidbits about Billy's early years that the other books lack; on the other hand, it has some very awkward writing and cringe-inducing phrases and metaphors. The book does not seem to have been edited carefully. Here is a review. While it has some interesting photos I had not seen before, it also has one photo that purports to be a photo of The Hassles prior to Billy joining the group, but it's just a photo where Billy is cropped out of the view. Originally, I believe the book was only available in the UK though the writer is apparently from Long Island and involved in the fishing industry. He knows Billy Joel through that connection. But as the review of the book states "[u]nfortunately, being a tuna fisherman of non-litigious temperament is not necessarily the ideal qualification for writing a book, or indeed for writing anything at all." If you are a casual Billy Joel fan, I would not recommend this book, but if you are a fanatic or collector, then it may be worth it. This is a short picture biography of Billy Joel. It is actually a decent overview of Billy's career up until 1984, just before he released Greatest Hits I and II. It doesn't go into too much detail, but it's good for the average teen fan, which seems to be the target audience. The books neglects to mention The Nylon Curtain entirely, which is an odd oversight. 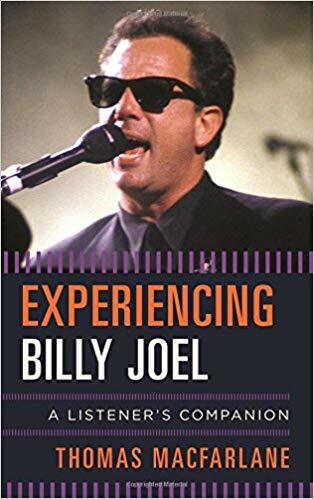 For a while, this was the only biography of Billy Joel published which was more than just a summary overview of his career. This book actually gives a fairly insightful discussion of each of Billy's songs through 52nd Street, and provides a reasonably entertaining depiction of his life. It's not an in-depth biography, but a good read. It also has some nice photos of Billy and Elizabeth Joel. I still have an old dog-eared copy of it that I read a million times as a young teen. I have not yet read this book, other than the preview on Amazon.com, but it sounds like a very charming book about one fan's admiration for Billy Joel since she (the fan) was a little girl. The author eventually meets the Piano Man one day as an adult. This is on my to-do list of books to buy and read. It's only 50 pages, could make a good gift for the Billy Joel fan who has everything. This is a children's picture book based on Billy's classic song "New York State of Mind." It comes with a CD of the song too. It is very nicely done. Similar to "New York State of Mind" (above), this is a picture book based on Billy's song "Lullabye: Goodnight, My Angel" that was written for his daughter Alexa. It comes with a CD of the song too. I bought this for my daughters and used to play the song to them at night when they were young.